The Shadow Conspiracy BTR (Bolt Type Raptor) Cassette Hub is made of 6061 hardened aluminum with 2 oversized bearings for added strenght and a longer lasting rolling life. It includes a 1pc, 9t chromoly driver with polymer bushings and is available with 36 holes in left or right hand drive. The hub holds a 17mm nickel-chromoly axle that accepts 14mm bolts that are readily replaceable. The BTR non-drive side hub guard is designed specifically for the BTR Cassette hub. The guard replaces the steel cone, maintaining the 110mm hub spacing so there is no need to stretch your frame. The guard is made of CNC machined 7075 aluminum and includes a steel insert for durability. …some sweet new artwork that matches our Shadow Classic logo. 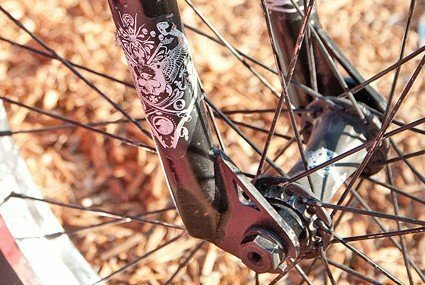 Slightly after the release of the BTR Cassette, the BTR Drive Side hub guard will be available. This guard is compatible with all chains and is made from CNC’d, heat treated, 4130 chromoly making it stronger than any other drive side guard available. Like its non-drive side buddy, this guard also replaces the cone and maintains the correct 110mm spacing, keeping you from stretching your frame. That is one ledge grinding, rail sliding monster of a hub. Ask your shop to order one today!